from 11:30 p.m. – 2 p.m. The Chamber created the Love Lunches for members and prospective members who love lunch and love getting out of their homes or away from their office for a chance to relax and meet some new people and network. Attendees are invited to come any time between 11:30 a.m. and 1:30 p.m. on the fourth Wednesday of each month. Each Love Lunch highlights a different Chamber member’s restaurant. Order what you want and pay individually. 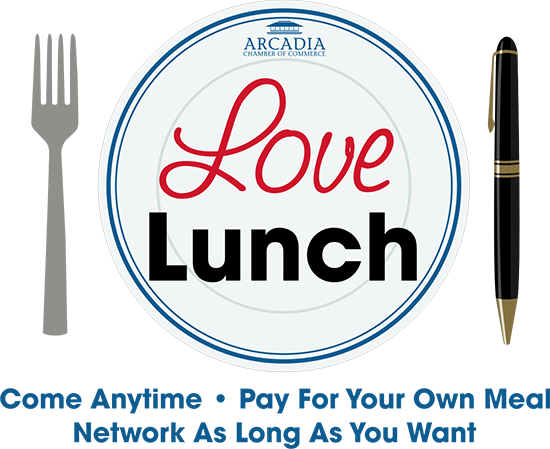 Restaurants are booked months in advance but if you are interested in booking your restaurant please contact Kristy at kristy@ArcadiaCaChamber.org.